Win Denial: Fight for the truth | SWITCH. 'Denial' is the gripping drama based on one of the most significant international legal showdowns in recent history. 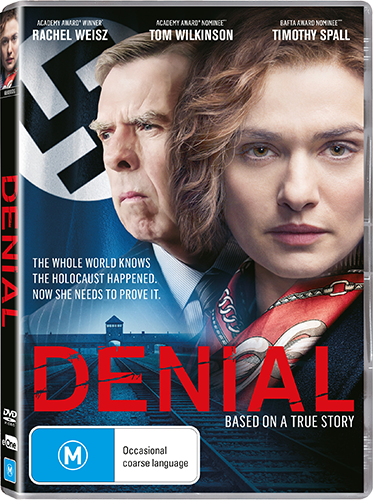 When American historian Deborah Lipstadt (Rachel Weisz) speaks out against the lies of the notorious English Holocaust denier David Irving (Timothy Spall) he sues her for defamation. The whole world may know that the Holocaust happened, but now, Deborah and her legal team need to prove it. Featuring powerhouse performances, 'Denial' is the riveting and inspirational true story of one woman’s relentless fight for historical truth. The 'Denial' competition has now closed. Winners will be announced shortly. Competition opens at 5pm AEST on Sunday 16th July 2017 and closes at 11:59pm AEST on Sunday 23rd July 2017. Five winners will be chosen at random on Monday 24th July 2017. To successfully win, entrants must fulfil the above entry conditions before the time the competition closes. Current members/followers are eligible to enter the competition. Only one entry per person. Only one winner per household. To be a valid winner, the entrant must not have won a prize from SWITCH within the last 28 days. Each winner will receive one DVD copy of 'Denial'. By entering, you agree to receive occasional emails from SWITCH in the future. If you decide to unsubscribe from these updates, any further entries will not be applicable. Only Australian residents are eligible to enter. 'Denial' is available on Digital and DVD on Wednesday the 19th July 2017 from eOne.